The Thrifty Mommy: Need Letters for Your Baby Nursery??? When we had my daughter last year there was one thing in her room that was left undone up until she was a few months old....The wall decor. Yes, the room was furnished, painted, and looked so pretty, but with out anything on the walls...it was just a bit too plain. So, I was on the hunt for a few months finding just the right things to furnish her walls with...things that I really liked and would leave up more than just the 1st year. If I had known better, I would of taken the same approach with my sons nursery way back when....live and learn, right?? Well, I was searching online, checked at a few stores, looked threw baby magazines and I finally came up with what I wanted for her one wall. I wanted to have her name in painted wooden letters. I had seen it online and just fell in love with the idea. So, hubby suggested we try AC Moore and Michael's to see what they had regarding letters...or if they even had them. Well, to my surprise they had them....a few different font styles and sizes too! I was impressed. We ended up going with one of the letter styles at AC Moore. We purchased them , hooks for the back, and the paint color we choose....with 40% off coupons, of course. Hubby painted them the next day, took 2 coats...then we hung them the day after. They look great!!! And even better was that we saved over $25.00 by painting them and putting hooks on ourselves. We even ended up buying a few very small wall decals and put them on either side of her name to make it a bit more girly. We love them!! We really think they look so nice in there. Ya know, you would think I would have checked out AC Moore, being I worked part time there for a bit in 2002. Nah. 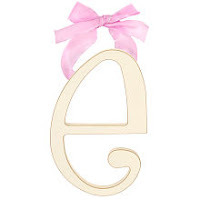 I just bought one initial for the E man & that was that. I will keep AC Moore in mind tho.